If your home has hardwood flooring, you may wonder whether you should refinish the wood flooring you already have or replace the flooring altogether. There are pros and cons to each method, and it all depends on your preference and the condition of your floors currently. Discover the pros and cons of both floor resurfacing and replacing to make the best decision for your home, family, and wallet. Cost: Replacing hardwood floors takes many steps; demolition, fitting, and installation. With simple floor resurfacing, only one charge is deducted because only one service is utilized. Additionally, replacing floors takes purchasing new wood flooring, which is undoubtedly the most costly route to redoing wood flooring. Floor resurfacing does not call for the use of any new products, saving you financial costs in the process. Precision: If you are already pleased with the wood type, positioning, and styling of your wood floors, refinishing is the best way to keep them the same. A new installation and different wood types may need a redesign, giving your flooring a different look and feel. The best way to keep the flooring you have but get a fresh and bright new look are to go with a floor resurfacing company. Time: In most cases, floor resurfacing takes much more time than complete renewal. The process is one which takes time to sand, polish, and sit for up to five days in total. During the process, the floors cannot be touched at all, which may cause you and your family challenges throughout daily life. Underlying Problems: If your floor is creaking, leaking, cracked, aged, rotten, or any other type of damage, simply refinishing them will not repair the underlying problems. With only a complete renovation can floorboards, which are what hold up the wood flooring, be examined and repaired/replaced. Keep in mind that hardwood floor resurfacing is only aesthetic; it is not problem-solving. Mess: Floor resurfacing is not only a time-consuming process but a messy one. 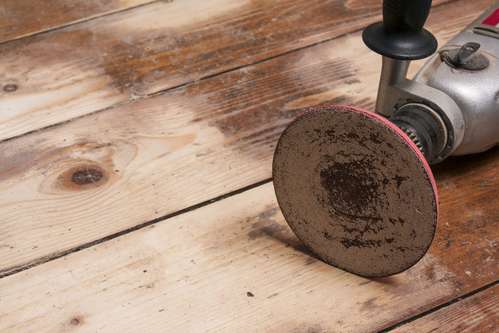 To resurface a floor, the wood must be sanded. This sanding creates piles of dust that are circulated into the air, picked up by your air conditioning system, and a safety hazard to you and your family. Additionally, since dust is so light, it takes time to settle. This means that you will be cleaning up dust around your home for days, weeks, or even months after the resurfacing project concludes. Eliminate Issues: Damaged floors simply should not be resurfaced because the underlying issues need addressing to prevent safety hazards. With a whole new wood floor, you won’t have to worry about the age, condition, or safety of your floors. Unless you simply need to get scratches or sun fading out of your hardwood flooring, a full replacement is the way to go. New Configuration: A new hardwood floor means new materials, stains, and even positioning. This means that if you want your flooring to be placed horizontally instead of vertically as they were previously, it can be done with brand new flooring. Additionally, this gives you the chance to change the type of wood and coloring used throughout your home. Price: The cost of materials and labor is usually more with a complete overhaul. Although the price is a little bit more, you get what you pay for. Because resurfacing your floors is merely an aesthetic fix, you’re paying for a service even though you may have to completely replace your floors in a matter of a couple years due to wear and tear. So, although the price is a bit more to replace floors, you’re actually making an investment into your flooring so that it last longer and looks better. Mess: Although installation of wood flooring is practically mess free if the cutting is done outdoors, the removal process may create some unwanted dust. Instead of cleaning for days or weeks after floor removal, invest in a floor removal service like the one provided by Dustbusters. We can remove your wood floors in as little as a few hours with our dust free system which allows your installation team to come in right behind us, saving you time cleaning and getting your floors completed. Want a quote for our services? Give us a call today at 866-883-8783 to speak with a floor removal specialist!